Uttarkashi is one of the younger parts of Uttarakhand, formed in 1960. There is an uncanny purity about the place, making it one of the most visited cities of religious relevance in the area. Totally untouched by industrialism, except to simplify the existence, without over altering, the town is like no place you have ever spent your time in. While lakes and temples are in great numbers, the whole aura of religion is not over powering. Uttarkashi will give you a sense of heightened divinity and an out of body experience, and it is one of the fewest places doing so, even on the trekking routes it has to offer. Pick-up from Dehradun Railway Station as per your flights time or Airport, drive to Uttarkashi. check in at hotel & relax, evening free for individual activities. Overnight stay at hotel. Have your breakfast at the hotel and Visit Vishwanath Temple & Others. Uttarkashi is home to a number of ashrams and temples and also to the Nehru Institute of Mountaineering. The name of the town reflects its similarity to and location (as north of) the city of Kashi (Varanasi). 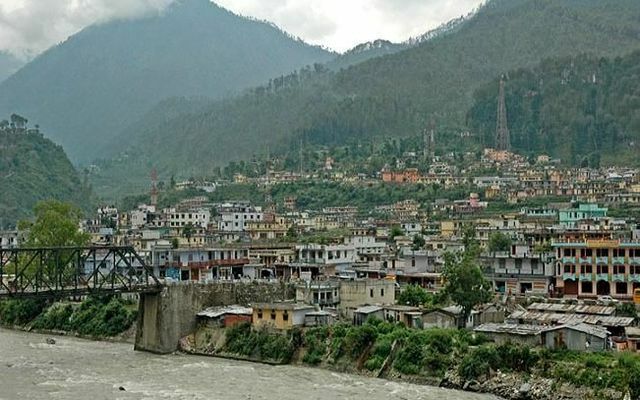 Similar to Varanasi, town of Uttarkashi is situated on the Ganges, lies next to a hill named Varun Parvat, on confluence of two rivers Varuna and Asi, has a ghat called Manikarnika Ghat and has a temple dedicated to Shiva (Kashi Vishwanath Temple) in the center of the town. Vishwanath temple - Vishwanath temple is one of the oldest Shiva temples in Northern India. Re-constructed in 1857 by Maharani Khaneti Devi of Tehri State in the ancient architectural style. It is situated at the heart of the town. A massive iron trident, symbolic of divine mother’s, is erected and worshiped from time immemorial at the temple complex. Ganeshji, Sakshi Gopal, Markandeya Rishi’s small shrines are also part of the temple complex. Akhand Jyoti as well as Akhand Abhishek, special aarti at morning and evening are offered. As per Skunda Puran, Uttarkashi is known as ‘Saumya Varanasi’, the abode of Lord Shiva in Kaliyug and counted as one of the twelve Jyotirlingas. Shakti temple - Right in front of the Vishwanath temple is Shakti temple. It has a big ‘Trishul’ of about 6 meters in height and a circumference of 90 cms. at bottom. Though there are different views about the making of this, the upper part of it seems to be made up of iron and the lower one is of copper. As per the epics this Shakti was thrown on the devils by the Goddess Durga(Shakti), hence it gets its name. Overnight stay at hotel. The nearest airport from Uttarkashi is the Jolly Grant Airport near Dehradun, about 180 km from Uttarkashi . The nearest railway stations to Uttarkashi are at Rishikesh (172kms), Haridwar (189 kms) from Uttarkashi.